In the spring of 1973, the inhabitants of the Imperial Cancer Research Fund Lincoln’s Inn Fields laboratories heaved a universal sigh of relief, probably the first time they had been able to breathe out collectively in a while. For the last few years, they had been squashed like scientific sardines into half of a building, and to make matters worse, had had to endure 40 months of heavy construction work going on next door as the extension of their existing laboratory space took shape. Now, however, all was finished, and the new had been seamlessly merged with the old, but for a slight bump in the floor at the join itself. Although the assertion of the architects, Messrs Cusdin, Burden and Howett, that the brick and granite façade provided “a quiet and dignified completion to the South West corner of the square” was definitely wishful thinking (the laboratory stood out from its elegant neighbours like a sore thumb), the interiors were actually rather well designed. The laboratories were and are large and well lit, with moveable internal partition walls to allow rapid remodeling of internal space, and the wood-paneled public areas give an impression of solidity and competence, without being too showy. The front of the Fifth Floor of the new building, with a view of the trees and flowerbeds of Lincoln’s Inn Fields, was prime territory, and as such, was the domain of Lionel Crawford, the newly appointed Chair of the Division of Cell and Molecular Biology, and Director Michael Stoker’s right-hand man. Lionel’s molecular biology lineage was distinguished, beginning with a Cambridge PhD on DNA synthesis in phage-infected bacteria in the 1950s. During his time there, he encountered Watson, Crick, Sydney Brenner, and many other fomenters of the molecular biology revolution; crucially, Lionel also met Michael Stoker, who widened his interest in bacterial viruses to include animal ones. Part of Lionel’s fascination was with the biological paradox of how viruses, such tiny and simple organisms, could wreak such tremendous havoc in the population; in the 1918 influenza pandemic, for example, it is estimated that ∼5% of the entire world’s population died, and a further 25% got very sick. Understanding how they worked seemed an intriguing puzzle, and when Stoker suggested that Lionel and his wife Elizabeth, an electron microscopist, move to Glasgow with him, they were happy to accept, especially because Stoker had an appetising prior assignment; he needed them to go to the West Coast for a couple of years to pick up some expertise in growing plant and animal viruses. 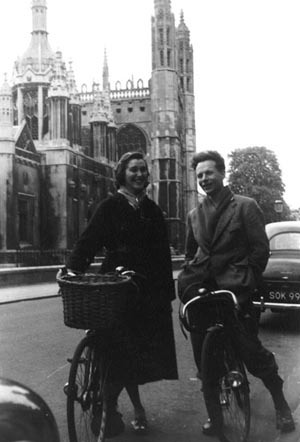 Lionel and Elizabeth Crawford in Cambridge, 1956. Lionel applied for and got a Rockefeller Foundation Travel Fellowship, despite shocking the Fellowship administrators by informing them that Elizabeth, rather than occupying the traditional wife’s role of looking decorative and flying the flag for Britain, had a Green Card and intended to work too. The Fellowship, although highly prestigious, was a pittance, but fortunately, poverty was no obstacle to having fun, and the Crawfords had a wonderful time, first in Berkeley and then at Caltech. At Berkeley, Lionel worked on tobacco mosaic virus for a while, and then migrated into Harry Rubin’s lab. Rubin had moved from Renato Dulbecco’s lab to Berkeley in 1958, and continued to work on Rous sarcoma virus, the RNA tumour virus he’d originally used for his focus-forming assay. After a year in Berkeley, the Crawfords upped sticks and moved down to Pasadena, to Caltech and Renato Dulbecco. After their initial meeting in Cambridge, Dulbecco and Michael Stoker had greatly taken to each other, and Dulbecco, still confined to the subbasement, was more than happy to do his friend a favour by teaching Lionel and Elizabeth the intricacies of animal virus work. Caltech at that time was still a major site of pilgrimage for molecular biologists, so the Crawfords met Boris Ephrussi, the legendarily bad-tempered Russian who had had a hand in virtually every major molecular biology advance before the discovery of the structure of DNA. Ephrussi was determined to maintain some semblance of European civilisation in the wastes of Pasadena; he insisted on afternoon tea accompanied by civilised discourse, although after a while, tea morphed into visits to the local ice cream parlour, and the discourse frequently descended into energetically loud arguments with Howard Temin. Working at Caltech also meant an opportunity to witness the Max Delbrück phenomenon at first hand. 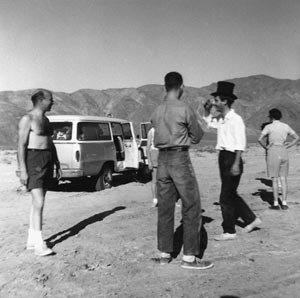 After an initial disappointing start, when Delbrück discovered that neither Lionel nor Elizabeth played an instrument and were not going to be able to join in his musical soirees, they became regulars on his famous camping weekends in the desert, together with an ill-assorted straggle of other international fellows. Delbrück’s camping technique fell at the lower end of the comfort and amenities spectrum; all were expected to sleep on the ground, although Manny, Max’s wife, did permit those who were pregnant, over 60, or both, to use air mattresses. Nevertheless, after the damp grayness of Cambridge, the desert was magical, and Lionel’s love affair with it continues to this day. When the Caltech year came to an end, the Crawfords returned to Glasgow, and Lionel set about disseminating his newly acquired skills to the cream of the United Kingdom’s young molecular virologists. His own research, characterising the properties of the DNA of animal viruses, went very well, and it was during his seven years in Glasgow that he got scientifically involved with Jim Watson. Initial polite exchanges regarding reagents and experiments soon changed into friendship, and the Crawfords took to spending as many of their summers as they could in the lively atmosphere of Watson’s lab, first at Harvard, and then at Cold Spring Harbor. His connection to Watson and annual extended visits to the States meant that Lionel was a well-known face to U.S. molecular biologists, and by the time of Michael Stoker’s appointment as ICRF director and Lionel’s resulting Glasgow-to-London move, he had a reputation as an excellent scientist with an eye for the unexpected result. Lionel’s new Fifth Floor labs were a far cry from the charred fridge and burnt benches of his first visit to Lincoln’s Inn Fields. All was new and state of the art, with dark-stained wooden benches, matching wood-framed shelving, and a plentiful supply of drawers and glass-fronted cupboards. The labs were furnished with a generous helping of centrifuges, water baths, shakers, incubators, and the general paraphernalia of lab life, with the biggest pieces stashed away in purpose-built equipment rooms. There was a dark room, a coffee room, office space, hoods for tissue culture and dealing with hazardous materials, and a corridor shower for those unfortunate enough to spill the hazardous materials on themselves. There was a cold room, a dark room, and a P3 lab, where especially dangerous recombinant DNA could be handled in conditions of negative pressure by suitably besuited researchers. And the whole lot was air-conditioned, a rare treat for the 1970s. Coming out of the lifts at one end of the floor and turning left, one passed through a set of double doors, over the bump in the floor signaling the start of the new building, and turned right into the large, open-plan Crawford lab. In there, Lionel had amassed a remarkable set of young scientists, all attracted by Lionel’s international reputation as the man to go to for polyoma virus research. Three, in particular—Bob Kamen, Alan Smith, and Beverly Griffin—would end up running their own independent labs and would be major catalysts of the research that transformed the Fifth Floor of the ICRF into one of the world’s best DNA tumour virus research environments. Alan Smith, who’d arrived at much the same time as Bob, was cast in a very different mould. Very English, educated at Christ’s College Cambridge, he had started off wanting to be an astronomer but switched over to molecular biology, infected by the excitement of what was going on in the MRC Laboratory of Molecular Biology, the new home of Francis Crick, Sydney Brenner, Max Perutz, and numerous other luminaries, and at that time the best place in the world for the structural approach to working out the nuts and bolts of life. During his PhD there with Kjeld Marcker, Alan developed a way of translating messenger RNA (mRNA) into proteins in a test tube, and using his new technique, discovered one of the fundamentals of how proteins are made; all of them begin with the amino acid methionine, coded for by the triplet DNA sequence ATG. After moving with Marcker for a short while to Copenhagen, he arrived at the ICRF, because he’d realised that it would be possible to use his very biochemical approach to study translation of the proteins being made by polyoma and other tumour viruses. Beverly Griffin had also arrived at the ICRF from Cambridge, but her antecedents were about as different from Alan’s as can be imagined. She was from the Southern United States, with a wonderful languid Southern accent, and had the sort of distracting beauty that causes mild brain disorder; susceptible scientists sometimes found themselves at a standstill in mid-sentence owing to looking at Beverly too hard. Starting off in the Chemistry Department in Cambridge, she’d eventually ended up working with Fred Sanger at the Laboratory of Molecular Biology, in the era in which he was developing the techniques in protein and DNA sequencing that would eventually earn him two Nobel Prizes. Her expertise in the fundamentals of working with the DNA sequence itself was a vital addition to the diverse range of talents on the Fifth Floor. There were two other notable inhabitants of the Fifth Floor front corridor—Guido Pontecorvo, one of the founders of the field of human genetics, semi-retired, but still an important part of the intellectual life of the ICRF, and Mike Fried. In terms of personality, Ponte and Fried were polar opposites, but together, they laid down a standard of excellence for the ICRF that kept everyone on their scientific toes. Mike, in his own words a brash New Yorker who always liked to have the last word in an argument, was an invaluable sounding board for ideas and experiments, because he was an unrelenting perfectionist when it came to science. He was another molecular biology aristocrat, having been one of Renato Dulbecco’s graduate students at Caltech. Lionel, who met him during his own year with Dulbecco, remembers him as “a brilliant student—Renato had a very high opinion of him. He had a very good academic record [and] was pretty good in the lab—very careful.” Mike’s reputation as a major figure in the field was made during his PhD, when he worked out how to make and detect a temperature-sensitive mutant of polyoma virus; using techniques similar to those of the phage biologists working upstairs, Mike isolated the first example of a defective virus that could only transform cells at lower temperatures and showed that his mutation had to be in a polyoma protein essential for viral replication. Thanks to this pioneering work, such conditional mutants, equipped with an on/off switch operated by changing the growth conditions, became powerful tools in early studies of cell transformation by tumour viruses and also opened up tumour virus molecular genetics; using conditional mutation, individual genes could be disabled, their functions deduced, and their positions in the viral genome mapped. The relevance of Mike’s work persists: conditional mutation remains an important weapon in the molecular biologist’s armoury to this day. Mike ended up at the ICRF thanks to Dulbecco’s second honeymoon. After remarrying in the early 1960s, Dulbecco decided to combine a visit to his new wife Maureen’s Scottish roots with a sabbatical year with Michael Stoker in Glasgow. They brought Mike with them to widen his scientific horizons, but the potent combination of his first foreign country and girls with cute Scottish accents was enough to ensure that other aspects of his life were also enhanced. He decided to do a postdoc in Britain, and then, after meeting and marrying his wife Nancy Hogg, to stay for good. His New York big city genes meant that London was always the draw for him, and thus, when Michael Stoker took over at the ICRF, Mike was very pleased to be offered a position there. By the early 1970s, he was in his own lab on the Fifth Floor, just the other side of the double doors to Lionel Crawford. As well as his own lab space, Mike also had dominion over the dark room, to get to which one had to navigate through the coffee room, juggling radioactive samples on the way in and an added cargo of freshly developed, dripping X-ray films on the way out. Lionel Crawford, Mike Fried, Beverly Griffin, Bob Kamen, and Alan Smith: the lab heads of the Fifth Floor. The personal chemistry between some of them rivaled that found in the toxic mix of developer chemicals, dropped samples, cigarette smoke, caffeine, and stale sandwiches enjoyed by users of the coffee room. Tales of shouting matches; battles over equipment, status, and territory; the mysterious overnight repartitioning of labs; political shenanigans—all abound, but above all, the abiding memory seems to be that the Fifth Floor was a family—a large, unruly, somewhat dysfunctional family, whose members fought, made up, and fought again, but a family nevertheless, remembered with surprising fondness. And the family had one abiding obsession: to do the best science it could. Whatever the personal differences, they were put aside when it came to experiments, because science came first for everyone who worked there. As a result, extraordinary things were accomplished in a very short time. The Fifth Floor labs were crowded places, stuffed to the brim with a polyglot collection of smart, ambitious students and postdocs keen to feed the scientific furnaces, in the hope that theirs would be the name on the next major discovery in molecular biology. More mundanely, people also came to the ICRF because they got paid well; very unusually for the time, incoming PhD students and postdocs did not have to fund themselves from external grants, because the ICRF gave them a very decent stipend. Once in, aspiring superstars found themselves in an environment superbly set up to give them every chance of success. In addition to being so well funded that virtually any experiment was possible, the ICRF, thanks to its lab manager Bill House, was one of only a small handful of lab in the world that had central facilities for media and reagents. Moreover, Lionel had set up the Fifth Floor so effectively that tissue culture cells and the viruses with which to infect them were available virtually on tap. Being able simply to go into a cold room or raid the freezer to pick up what you wanted, or to talk to Kit Osborn, Lionel’s wonderful tissue culture technician, when you needed cells, gave the Fifth Floor labs an enormous advantage over their competitors, who were all toiling away making solutions when they could have been doing experiments. Kit Osborn was a prime example of another of the ICRF’s invaluable assets—its technical staff. Far in advance of the times, Bill House had had the vision to put in place a proper training programme for technicians, who could come in as school leavers and, if they had the aptitude, work their way up. Starting in the central media kitchen, technicians could earn a place in a lab, and in many cases, progress to doing a PhD and beyond, all on a paid work-study scheme. This enlightened strategy resulted in a large cohort of extremely competent people, and on the Fifth Floor at least, most labs ran at almost a 1:1 ratio of technical to scientific staff. Experiments performed by two well-trained people take an awful lot less time, and the presence of technicians who knew their way round the lab techniques and protocols ensured that even the most cack-handed student had a strong chance of succeeding. Good staff and a great setup are solid foundations on which to build, but what made the labs buzz was the constant flow of communication. The labs were cross-fertilised by the many interactions between their occupants; new techniques, being invented almost daily at that time, spread rapidly because there was a general willingness to collaborate and cooperate. If somebody needed help with a protocol, rather than struggling along with a printed recipe, they could go and ask the person who had developed it, or at least find somebody who would know the parts of the recipe that hadn’t made it into the written instructions. In this respect, molecular biology is a lot like cooking, although the results are not generally edible. New ideas spread just as quickly. People talked science all of the time; there were coffee breaks, tea breaks, lunches, seminars, journal clubs to discuss exciting papers, and the evening ritual of going to The George, the pub round the back of the lab, which functioned as an alcoholically endowed extramural meeting room. The George was where you went for a quick pint and a sausage before going back to start your evening’s work (the sausages were so horrible that one postdoc started making his own, left science, and founded a best-selling sausage company, Aidell’s, in California), or where you spent long inebriated nights discussing data, theories, and gossip, or drowning your experimental sorrows in the presence of sympathetic cosufferers. Talking is the lifeblood of science, the way work and ideas can be critically examined from all possible angles, to generate further experiments and theories or to be unceremoniously trashed. Furthermore, to find out what’s going on in the outside world, there is no substitute for scientific gossip, the scuttlebutt borne back from conferences and disseminated round the lab, often weeks or months before the resulting papers appear in the journals. 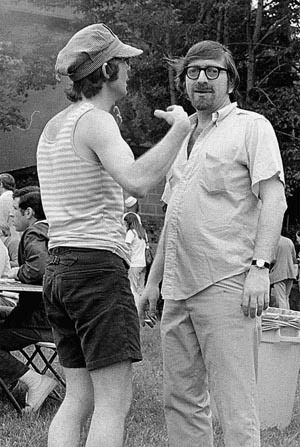 The annual Tumour Virus meetings, held throughout the 1970s at the ICRF’s spiritual sister lab, Cold Spring Harbor, were always a major swapshop for ideas, and many collaborations were forged there at the beach, in the bar, and at all the places in between. Speculation, argument, and the occasional wild intuitive leap—these, combined with a hefty dose of rigorous logic and a profound knowledge of the field, are what drives good research, and all were present on the Fifth Floor in abundance. Life on the Fifth Floor was made yet more exciting by the presence of migratory flocks of Americans, often from Cold Spring Harbor, come to London to check in with their colleagues, have some fun, and do the experiments that they were unable to do back home because of a cloning moratorium (in a brief fit of overzealous caution, the United States stopped work with recombinant animal DNA for 18 months in the mid-1970s). Postdocs and graduate students were not only able to hang out with the finest minds in molecular biology, but were also treated to the spectacle of some of the eminent American visitors oversampling the wares of The George, scrounging for dates to enliven their out-of-hours existence, and generally spicing the place up. The sabbatical visitors got visits from their friends too, and in some weeks, the choice of top-quality seminars was so great as to start to cut seriously into time at the bench. At the time of my sabbatical the ICRF was probably the best place in the world to be working on both the RNA and DNA tumor viruses of animals. Smart trainees who had remarkable careers before them—like Richard Treisman, Ed Harlow, and Adrian Hayday—were abundant. And there were many visitors—some on sabbatical, like me and Paul Neiman; some on hand to pursue romantic interests and to use recombinant DNA technology under Britain’s more liberal rules, like Joe Sambrook and Mike Botchan from Cold Spring Harbor. The facilities were superbly set up to make efficient use of my time; the labs were close to theatre, opera, and museums; and I felt very welcome for the twice daily tea breaks, which I rarely missed. Because there was no email and the phone was expensive, I remained in only intermittent contact with my lab group, and travelled home only once during the year. As a result, I was able to do some of the best experimental work of my career and some of the best thinking regarding future work. Because we found a large old house in Cross Street, Islington, I was able to ride a bike to work nearly every day, and we were able to hire a live-in nanny who freed up more time for work and culture than might otherwise have been possible for parents of children then about 1 and 5 years old. It was flamboyant and incendiary, but I thought it was a pretty good place to train. There was a certain generation represented by people like Bob Kamen who had cut their teeth on phage, and had a certain rigour and appreciation of what very rigorous science was about. We felt similarly working on these DNA tumour viruses, because the genetics, transcription and protein analysis were so exquisitely interdigitated that you felt really good in that environment, despite the fact that some people’s behaviour was not ideal! People worked obsessively hard. Staying far into the night and coming in for at least some of the weekend was normal, even for the lab heads, who might be expected to want some kind of private life. The long hours were OK; the experimental work might be lengthy and sometimes tedious, but there was always somebody else around to talk to, or to nip out to The George with. In one never-forgotten incident, there was also a very hot and bothered American visitor to rescue from the high-security P3 lab in the middle of the night—how he had managed to lock himself in there in the first place was anyone’s guess. And once work was finished, there were the parties, although curiously, participants seem to be a little hazy on exactly what made them quite so legendary. In the early 1970s, knowledge regarding SV40 and polyoma was still fairly limited, and there was a lot of scope for discovery. The size and shape of the viral capsid, the protein coat that enclosed the infectious viral genome, was known, and the double-stranded DNA genome had been shown to be circular. There was some understanding of what happened during a productive viral infection, in which a virus enters a cell, replicates, and then bursts (lyses) the cell, releasing hundreds of progeny. There were two stages, early and late, classified as happening before or after the viral DNA was replicated, and different mRNAs and proteins were made at each time. Late-stage proteins were to do with making the structural bits of the virus, fitting out the newly replicated DNA genomes with capsid coats before their release by lysis. In contrast, in the early stage of infection, the viruses’ main concern was to persuade their host cells to fire up DNA synthesis. This they did by trickery; because the viral genomes were limited in size by the rigid capsids in which they were contained, they had evolved to carry a cargo of genes able to activate the host’s own replication machinery, which could be fooled into copying the viral DNA in addition to its own. The early stage of infection was most interesting to those concerned with how DNA tumour viruses caused cancer, because the early genes were the only things the virus switched on during transformation, the lab-induced state roughly analogous to tumour growth in animals. Viral infections leading to transformation were always nonproductive—there were multiple cellular changes leading to uncontrolled growth, but there was no lysis and no production of more virus—indeed, the virus disappeared. The mystery of the missing virus in tumour-virus-transformed cells and cancers was cleared up in the 1970s, when it was found that the viral genomes forced all or part of themselves into the host cell’s own chromosomes, thereby guaranteeing their propagation every time the hapless cell divided. In an interesting insight into the mind-set of the tumour virologists, who tended to view everything from the standpoint of the viruses, this rather violent process had been given a positive spin and was called integration (similarly, the cellular Armageddon of lysis was described as “liberation of infectious particles”). In transformation, as early but not late events happened, an early protein was the obvious culprit for corrupting the cell. The likely villain had a name, T (for “tumour”) antigen, but only a nebulous identity because of the method of detection. When its xenophobic immune system finds a developing tumour, an animal with a virally induced cancer makes antibodies directed against tumour antigens, the foreign-looking bits of the tumour cells. The tumour antigens are likely to derive from the viral proteins because these are the most alien component of the tumour and will elicit the biggest immune response. Antibodies circulate in the bloodstream, and thus extracting blood from tumour-bearing animals produces a tumour-specific antiserum, which can be used for experiments. Quite early on, in the 1960s, it was realised that when used to label cells in tissue culture, tumour antisera went straight for the tumour cells, ignoring the normal control cells. Used at such low resolution, the antisera were like burglar alarms, able to detect the presence of T antigen on the tumours, but unable to tell what it was; T antigen could have been a posse of tiny tap-dancing penguins, for all the antisera could tell, although admittedly this was unlikely. Whatever the true nature of T antigen, its ubiquitous presence on tumours meant that it was the obvious suspect as the inducer of the cancer; how it might do this was, however, unknown. In line with the virus’s need to subvert cellular DNA synthesis, there was speculation that T antigen’s normal function might be to switch on the cell’s replication machinery, perhaps by suppressing a vital negative regulator—a bit like taking the handbrake off in a car—and in cancer, this function was never switched off, leading to tumours. The basics of DNA tumour virus biology were therefore established: DNA tumour viruses entered cells, most often replicating and killing their hosts, but sometimes integrating to cause tumours, probably by some mechanism involving the mysterious T antigen. But how was all this accomplished? There was almost no understanding of mechanism, and the matters for investigation for the Fifth Floor and their competitors and collaborators in the DNA tumour virus lab around the world were fairly obvious, if a bit daunting. Nobody knew how many genes the viruses had, what proteins these genes encoded, and what the proteins did. Nobody knew how the genes were organised on the viral DNA or what their DNA sequences were. Nobody knew how the viruses managed to squash all their DNA into the claustrophobic constraints of the viral capsid, and nobody knew how T antigen managed to induce cells to replicate their DNA uninhibitedly to form tumours. With the availability of restriction enzymes, mapping viral genomes became possible, and after Herb Boyer and Stan Cohen’s demonstration in 1972 that a piece of restriction enzyme–digested DNA could be introduced into a plasmid, a small circular DNA parasite able to replicate in bacteria, cloning was born. Once put back into bacterial cultures, plasmids carrying cloned inserts could replicate their DNA very efficiently, meaning that a small amount of DNA could be amplified into the large amounts needed for the experimental techniques of the day. In tandem with these advances, methods were developed to analyse DNA, RNA, and protein more easily. The major advance was the invention of gel electrophoresis. Up to the late 1960s, DNA, RNA, and proteins could only be analysed at extremely low resolution by electron microscopy, or at slightly higher resolution in laborious sedimentation experiments in which molecules were separated on the basis of their size by spinning cell extracts in ultra-high-speed centrifuges for many hours, sometimes days. Gel electrophoresis cut separation times to 2–3 hours at most; it had far higher resolution, down to a single base in the case of DNA and RNA, and for the first time, molecules could be “seen” as stained or radioactively labeled bands, which could then be analysed further. Gels could be tailored in size, thickness, and chemical composition, and were easily made by pouring liquid gel mix into flat moulds and allowing it to set. Molecules were separated, still on the basis of size, by being pulled through an electrical field. A gel was submerged in a suitable charge-carrying solution between two electrodes, and when the current was switched on, molecules migrated from their loading slots at the negative end of the gel towards the positive electrode at the other end. How far they went depended on how big they were; large molecules moved slowly, and small ones wriggled through the gel matrix far faster. After they’d been run, gels could be stained with DNA or RNA fluorescent dyes, visible under UV light, or, if molecules had been radiolabeled, the gel could be wrapped in Cling Film and exposed to X-ray film, revealing the radioactive bands; for example, in the case of Danna and Nathans’s SV40 restriction map, there is a ladder of 11 bands. In 1974, gel electrophoresis became even more useful when Ed Southern worked out that gels could be blotted wholesale onto special membranes made from nitrocellulose, which could then be probed with radiolabeled (“hot”) DNA or RNA. Southern blots revolutionised mapping; because it was now possible to pinpoint exactly which restriction fragment a probe recognised, the location of specific DNAs and RNAs within genomes, whether viral or otherwise, could now be established. Southern blotting was followed in 1977 by a method for transferring RNA rather than DNA from gels, inevitably dubbed “northern blotting,” and in 1979, by “western blotting,” using antibodies to probe protein blots (“eastern blotting” doesn’t exist, but not from want of trying; many researchers have tried to appropriate the name for a multitude of new techniques, but none have succeeded in making it stick). Nowadays, in a world of endless kits, standard equipment, and nonradioactive labeling methods specifically designed so that even a precociously talented toddler could do molecular biology without poisoning herself, it is hard to appreciate how difficult and potentially hazardous it was to do experiments then. Almost all of the equipment and reagents were laboriously homemade. At the ICRF, enzymes were cooked up in vats in the second basement, and media, agar plates, and some reagents were made in the kitchens. Apart from that, you were on your own and had to make up solutions and reagents yourself (one extraction reagent was abbreviated to 2FC, ostensibly an acronym for its ingredients, but mostly because it was Too F***ing Complicated to make). Gel boxes and equipment were made in the workshop to patterns specified by the scientists, and the skilled craftsmen working there were highly valued. Because everything had to be performed on a very large scale, the limits of resolution of most methods still being fairly low, labs were full of stuff; cupboards in the labs and corridors were jammed full of glassware; tissue culture paraphernalia littered the hallways and shelves; gel boxes and the power packs to run them clogged the benches; and measuring cylinders, pipettes, pipette tip boxes, tubes, Petri dishes, and flasks of all possible sizes were everywhere. In the tiny offices, even a slight tendency to untidiness resulted in chaos, with tottering piles of papers, journals, and, in one case, a spent matchbox collection, infringing every known Health and Safety regulation. The clutter and general dinginess were not helped by the miasma of cigarette smoke and the presence of senior technician Bob MacCormick’s dead pheasants, often to be found hanging in the cold room after a weekend’s successful shooting. To make an RNA prep, you would do a viral infection which would involve infecting a hundred 9 cm dishes of cells. Then you’d have to scrape them all with rubber policemen [an exotic name for a prosaic tool for getting cells off tissue culture plates] and lyse them. Everyone was using buckets of stuff because everything was low specific activity—there weren’t pinpoint methods for analysing RNA. You’d have to make polyA+ RNA [a.k.a., mRNA] and because that was only two percent of the total cellular RNA if you wanted to quantify it accurately you’d have to make a lot of it. It was a very blunt instrument. We got 32P (a highly radioactive phosphate compound, confusingly referred to orally as P32) from Amersham. You’d get it on a Friday, and it would come in at lunchtime, so you could dump it on to your cells after lunch. There were just tons of hot phosphate! To make any probe, we would radiolabel DNA in vivo. For a DNA prep, you’d take four dishes of cells, infect them with polyoma, and then you’d put 10 milliCuries of 32P on a dish. That would be your Friday afternoon. You’d leave the cells for three hours from 1 to 4pm, then you’d have to make supernatant. So you’d fart about with these red hot plates making your lysate behind screens, and dump the lysate in Corex [glass] tubes. The supernatant had to extract at 4°C for three hours, which conveniently coincided with the opening of the pub, so you’d let that cook for a bit, and after a couple of beers you’d go back and spin out the gunk and take the supernatant and run it over a ion exclusion column. You’d get the viral DNA out and you’d then dry it down and you had some hot DNA that you could use for a hybridization experiment. Labelling fragments was a big pain in the bum. And all this was repeated day after day, week after week, with astonishing persistence on the part of the investigators. What exactly was achieved by the Fifth Floor labs? The short answer is that they helped build the foundations of modern biological science, in a series of contributions that were intricately tangled up with contemporaneous work performed in the powerhouse labs of the United States. They then went on to populate the world’s labs with their trainees, many of whom have risen very high. They were, to paraphrase Michael Stoker in his valedictory Director’s Report, riding a bandwagon, but playing at the front. The field moved fast, and they had helped establish it and continued to drive it. Early on, an informal arrangement on how to carve up the work was agreed, with each person playing to his or her strengths: Lionel would continue with his work on viral DNA, its structure and how it replicated, with a bit of protein work on the side. Mike would do the molecular genetics, making mutants and using them to locate viral genes and determine which were important. Beverly (who had moved shortly after her arrival into Mike’s lab space on the other side of the double doors) would map and sequence the polyoma viral genome, working out where genes were located and what they encoded. Alan would work on viral proteins, and Bob would work on viral RNA. The overarching issue of how the viruses caused cancer would be tackled by determining which bits of their genomes mattered for transformation and by studying T antigen. There was complete sharing of information. Beverly and Mike’s genetic and sequencing data were fed hot off the presses into Bob, Alan, and Lionel’s work on RNA and protein, and vice versa. And if, as was sometimes the case, the lab heads were currently fighting about something, the information flow still continued through their postdocs and PhD students. The result was phenomenally rapid progress on all fronts. Mike and Beverly’s lab, working first together and then rather more separately as their interests diverged, made the first restriction map of polyoma DNA, following closely on the first SV40 map of Danna and Nathans. Mike expanded his collection of mutant viruses to those having more subtle defects, and by using a neat technique to chop and change bits of DNA, he was able to use the polyoma restriction map to pinpoint where the defects lay in the virus and therefore where important genes were located. Until cloning and sequencing became commonplace, the polyoma mutants he generated were also the biological backstop for everyone else on the floor; predictions of which proteins were implicated in transformation could always be checked, because the protein concerned had to be mutated or absent in the corresponding viral mutant. 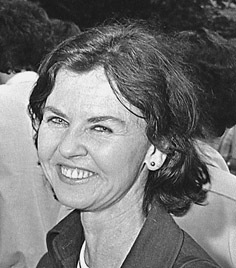 In parallel, Beverly ramped up her DNA sequencing, and in a series of high-profile papers in Cell and Nature, published the complete DNA sequence of polyoma virus at the end of the 1970s. Polyoma, and SV40, completed by Sherman Weissman’s lab at Yale in 1978, were the largest pieces of continuous DNA sequenced at that time, an enormous technical achievement. The number of bases that could be sequenced in one experiment numbered in the tens, and to ensure accuracy, a sixfold redundant coverage of the polyoma genome meant that the total number of bases sequenced was more than 30,000. The sequence had to be read from X-ray films (naturally, the experiments relied on lots of screaming hot 32P to label the DNA) and pieced together entirely by eye, a jigsaw puzzle of epic proportions. The whole process was a mix of long hours of tedious repetitive work combined with the need for extreme accuracy to ensure that every base of the sequence was correct. DNA tumour virus investigators were handed the blueprints of their viruses with the polyoma and SV40 sequences, twin Rosetta stones allowing the mysteries of the viral genomes to be resolved. Regions occupied by genes could be identified, and the sequences of the proteins encoded by the genes could be deduced, by translating the triplet codons specified by the DNA into the run of amino acids making up the protein. The sequences of the mutant genes mapped in Mike’s genetic screens could be compared with their normal counterparts, and the amino acid changes causing the mutation identified; sequence could be correlated with functionality, and guesses made regarding what the proteins did, and what was going wrong. The two virus sequences were also the start of something much bigger: they were the first demonstration that it was possible to assemble a complete genome sequence and that the information gained from the sequence was valuable. This led to the sequencing of much larger viruses, which, in turn, produced the exponential explosion in DNA sequencing technology and analysis culminating in the unveiling of the draft sequence of the human genome in 2001. Today, sequencing DNA is a triviality, performed by robots that can easily sequence millions of bases in a single day. In an extension of his transformation mapping, Mike also started on some of the earliest experiments cloning bits of polyoma virus, inspired by his collection of sabbatical visitors, who brought with them Boyer and Cohen’s DNA cloning protocols. Mike, being a very visible star in the polyoma firmament, was a prime destination, and in addition to Harold Varmus, hosted, amongst others, Phil Sharp, Joe Sambrook, and Mike Botchan. Joe Sambrook came even more frequently after he fell in love with Mary Jane Gething, who was working downstairs in Mike Waterfield’s lab. 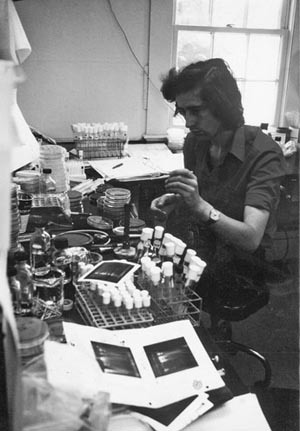 Mike’s mastery of cloning resulted in a very significant Nature paper in 1979, which resolved a key safety issue in the cloning of eukaryotic DNA. As mentioned above, several of the ICRF’s transient American scientists were there in part to get around the cloning ban that the U.S. biological science community had voluntarily put in place in the mid-1970s. Cohen and Boyer’s demonstration of cloning, with its potential to move genes from one organism into another, had provoked extreme alarm in some of their fellow scientists, with inevitable fears of spreading dangerous genes through the human and animal populations. Even when cloning resumed, the suggested restraints mean that any cloning experiment involving eukaryotic genes had to be performed under extraordinarily stringent containment, which, being expensive, meant many experiments could not be performed at all. Although this, as pointed out by John Cairns, by now head of the ICRF’s North London outstation at Mill Hill, meant that the less competent had a perfect excuse for not doing hard experiments, it was a real nuisance, especially as it became increasingly clear that the regulation was excessive. Mike and his collaborators put the lid on the controversy by cloning the complete polyoma genome into a bacterial plasmid, introducing it into mouse cells, and showing that in this form it was not infectious and could not spread. Joe Sambrook and Mike Fried, 1974. The problem of what mRNAs and proteins were made by SV40 and polyoma was occupying Bob, Lionel, and Alan, on the other side of the double doors. Their large, shared lab had an interesting appearance. At the Smith end, it was cluttered, but nevertheless forensically tidy, reflecting the extreme neatness of Alan and his head technician, Rob Harvey. At the Kamen end, it was a chaotic mess, where new experiments were begun not on a cleaned and empty bench, but in a small space made by pushing to one side the heaped detritus of the previous day’s work. In the centre, Lionel’s bay provided a convenient buffer zone, valiantly fighting off the encroaching tide of junk. Lionel, very much in the Cambridge scientific tradition, did his own experiments and facilitated those of his lab, only putting his name on papers if he had contributed directly to the data. His work on DNA structure and replication continued to attract attention, notably when he located the polyoma origin of replication in 1973, and broadened to include more biochemical analyses of the proteins involved. 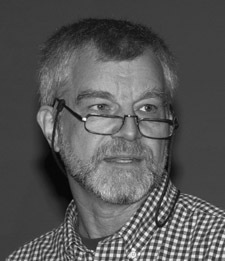 With a young Bruce Ponder (just retired as Director of the CR-UK Cambridge Research Institute, but then a newly qualified MD), Lionel produced a trilogy of papers on how viral DNA was wrapped for packaging in the capsid by host proteins called histones, and how this differed from normal histone packaging of host DNA. 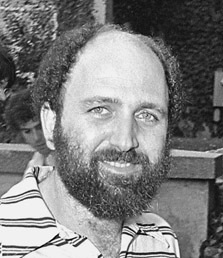 On the transformation side of things, to try to develop a better way of turning viral mRNA into functional protein, Lionel also hired Ron Laskey, folksinger extraordinaire and a future giant of the DNA replication field. Laskey, who had been a student in John Gurdon’s lab, spent two years with Lionel looking at whether the eggs of the clawed frog, Xenopus laevis, were a suitable venue for translating viral mRNA into functional viral protein. The proteins the eggs made were full length and functional, an important advance, but the dream of trying to get transformation in frog eggs by injecting different mRNAs was, sadly, never realised. Cell-free translation, once methods of making viral mRNA able to programme the system to produce protein were worked out, yielded a rich vein of experimental data. The Smith and Kamen labs were able to figure out where in the polyoma genome the viral mRNAs came from, and Bob had his first lesson in paper writing from Alan when they jointly published a Cell paper showing the genomic location of the viral capsid proteins. Tony, like Harold Varmus, was also a teabreak enthusiast: “Best of all, in the fine English tradition, everything stopped for tea in the morning and coffee in the afternoon, during which all the latest ideas were hotly debated and my views were solicited as though I should know what I was talking about” (Pawson 2008). Down at the transcription end of the lab, Bob soon realised that working on the mRNA of tumour viruses, rather than being a brief prelude to understanding virally induced tumours, was a full-time undertaking, full of technical and conceptual pitfalls. It all started off well; using low-resolution techniques, made even more difficult by the tiny amounts of RNA he was trying to detect, he was the first to locate the early and late mRNAs of polyoma on the viral genome, and to work out that one of the two complementary strands of DNA in the viral double-stranded genome was used to transcribe early mRNA, and the other strand made the late mRNAs. However, things went pear-shaped when he tried to map polyoma late mRNAs more precisely, by doing Southern blots using radioactively labeled viral mRNA to probe the ladder of restriction fragments produced by digesting the polyoma genome. When Bob chopped polyoma DNA up and did this experiment using late polyoma mRNA as the labeled probe, bands lit up on the film, sure enough, but they looked all wrong. The RNA bound to restriction fragments that Bob knew from Mike and Beverly’s polyoma genome map were not next to each other, which was totally weird. In bacteria and phages, where all the transcription work had been performed to date, mRNA was transcribed from one long unbroken strand of DNA, so one could match it exactly to the region of DNA from which it came. Therefore, in Bob’s Southern blots, the polyoma mRNA should only hybridise to adjacent DNA fragments, not jump around like a demented salmon on a fish ladder. Bob abandoned his half-written paper to an upper shelf and got on with other things for a while. The puzzle was finally solved by the ICRF–Cold Spring Harbor connection, in the person of Joe Sambrook, who showed up in Bob’s office one day in 1977 with some advance notice of a major scientific breakthrough by Phil Sharp at MIT and Rich Roberts at Cold Spring Harbor—the discovery of splicing. Both Sharp and Roberts were working on adenovirus, a larger DNA tumour virus that can cause human cancer, and both had now shown that adenovirus late mRNA molecules were made in an entirely novel way. As in bacteria, the RNA was transcribed as one long molecule, but then there was a new, eukaryotics-only twist to the story: the long RNA was then spliced. Exactly as one edits out an unwanted scene in an old-fashioned film reel, the cell chopped loops out of the precursor RNA to produce the final, smaller molecule. Therefore, as Bob had been seeing back in London, mapping of the final product would make it look as though the RNA was being made from bits of unconnected DNA. Bob was initially reluctant to believe what he was hearing that day: “Sambrook was a bit of a character, funny but with an edge—he looked a bit like Mick Jagger. He started telling me about this splicing story and I thought it was an elaborate hoax to get me to bite so he could call me a fool. So I called him on it, and he exploded and said ‘you idiot!’ So not only did I miss it but I didn’t understand it!” Bob was not alone in his surprise that splicing existed, or in his chagrin at missing it; there were lots of unexplained transcription results lying on the shelves of multiple labs at the time. Sharp and Roberts won the 1993 Nobel Prize in Physiology or Medicine for their insight, leaving their colleagues in the field to contemplate what might have been had they looked at their strange results in a different light. After splicing was discovered, eukaryotic mRNA studies were a lot easier to decipher, but also became a lot less simple. Once it was proven that splicing was not just a viral peculiarity, but happened in all eukaryotes, it was clear that transcription of a eukaryotic genome was incredibly complex, with multiple mRNAs being made from the same stretch of DNA, mRNAs starting and stopping in different places, and differential splicing galore. The study of the DNA sequences controlling transcription and the proteins that bound to those sequences to direct the process, became and remains a field in its own right, and transcription research continues to produce unexpected explanations for mystifying data. For SV40 and polyoma, splicing was the key to understanding why the viruses were so powerful. In getting around the constraints of being packed into a small capsid, both viruses had come up with an ingenious way of maximising their impact on a cell. Like tiny tardises, their genomes had the potential to encode far more than had been thought possible, because multiple differentially spliced mRNAs could be transcribed from the viral DNA. One of the DNA tumour virus puzzles solved by the discovery of splicing concerned the nature of the viral T antigens. As discussed above, the T antigens of polyoma and SV40 started off as abstract definitions for the way tumour-specific antisera could light up virally induced tumour cells in immunocytology assays. People assumed that T antigens existed and inferred their function in cancer from the evidence (transformation) left at the scene of the crime, but it was impossible to tell whether T antigen was an oncogenic gang or a lone perpetrator. This all changed when, using the tumour-specific antisera as bait, people started to fish out T antigen from radioactively labeled cellular protein soups. This technique, immunoprecipitation, when combined with gel electrophoresis, meant that the T antigen “catch” could be seen by running the immunoprecipitated proteins on a gel. For both polyoma and SV40, there was always a protein band hovering at around 90–100 kDa (kilodaltons) on a gel (molecular biology operates on a tiny scale, and needs its own tiny units; a kilodalton, abbreviated kDa, has a mass of ∼1.66 ×10−24 kg). Because this was about the maximum size that the whole early region should be able to encode, the 100-kDa protein reigned supreme as T antigen for several years. The belief that T antigen was just the one 100-kDa protein was abandoned in 1977, in the same year as splicing was discovered, when both SV40 and polyoma were shown to have two T antigens. The original 100-kDa protein was renamed large T, with its new smaller companion unsurprisingly christened small T. SV40 and polyoma small Ts were both ICRF finds, one discovered by Lionel, off on sabbatical on the West Coast in future ICRF group leader George Stark’s lab, and the other by Yoshi Ito, a postdoc in Renato Dulbecco’s fourth-floor lab. (Ito was to become another star of the cancer field and was also a major force behind Singapore’s transformation into a world-class centre for biomedical research.) In the case of SV40, Lionel and his Stanford colleagues also scored a first regarding small T’s origins, when they proposed that it shared the same front end (“amino terminus”) as SV40 large T but had a different back end (“carboxyl terminus”); in all but name, they had shown that splicing could occur, and their data slightly preceded Sharp’s and Roberts’s. The relationship between large and small T was rapidly confirmed, at the protein level by Alan Smith’s lab at ICRF and Carol Prives and her colleagues at the Weizmann Institute in Israel, and at the mRNA level by Phil Sharp and Arnie Berk at the Massachusetts Institute of Technology (MIT). The two proteins are made from the same genomic sequence but are splice variants: SV40 small T mRNA is unspliced and only encodes 174 amino acids before a stop codon is reached, and translation, and hence small T protein, terminates. Large T mRNA also starts off at the same place but is spliced to remove the sequences unique to small T, including the stop codon; it therefore makes a far larger final product 708 amino acids long. The discovery was important not just to the SV40 field; Sharp and Roberts’s adenovirus splices were in an untranslated part of the RNA, so the large T/small T result was the first example of splicing in a coding region. It illustrated just how exquisitely precise the process had to be; an exact base-to-base join always had to be made at the splice junction, because otherwise the proteins translated from the mRNA would be gibberish. Middle T was an important find, because it was the oncogene, the cancer-causing gene, of polyoma. Yoshi Ito’s paper had hinted this was the case, because middle T was not made or was defective in mutant viruses unable to transform cells, but it took a cloning tour de force executed by Richard Treisman in the Kamen lab to establish middle T’s status as chief villain conclusively. Using techniques so new that they barely existed, Richard poked a hole in the polyoma genome such that only middle T could be made, and went on to show with help from his then girlfriend, Uli Novak, a student with Beverly, and Bob’s technician Jenny Favaloro, that the middle T–only virus could still transform cells. Joining in on the act, a collaboration between Beverly Griffin, Alan Smith, and Mike Fried showed that middle T was associated with a protein kinase activity, which proved to be the key to its activity. Protein kinases stick phosphate groups on amino acids, causing changes in how proteins can interact with each other, and affecting how signals are passed around in the cell. Phosphorylation, and its opposite, dephosphorylation, is one of the major regulatory mechanisms used by cells; the reversibility of the reaction makes it a versatile and rapid on/off switch, and finding that middle T was capable of overriding such a switch was tremendously exciting. The work was published in back-to-back Cell papers in 1979 with two other labs, Tom Benjamin’s at Harvard, and the Salk grouping of Hunter, Hutchinson, and Eckhart. Tony Hunter’s paper additionally showed that the protein kinase activity was specifically aimed at tyrosine residues, which had never been observed before. Alan, after leaving the ICRF in 1980 for the National Institute for Medical Research at Mill Hill, showed with Sara Courtneidge that the tyrosine kinase activity came from a cellular protein called c-Src, with which middle T associated. To finish the middle T story, c-Src was the first of many proteins with which middle T was shown to interact, and all these multiple interactions mean that middle T sits at the centre of a web of signaling pathways and turns them all on, driving cells into uncontrolled replication and thus causing cancer. Using middle T as a probe for derangement of cellular function proved to be hugely important for cancer research, more than fulfilling the DNA tumour virologists’ hunch that their viruses were a simple way into a complex system. Middle T strikes right at the heart of a cell’s regulatory pathways, and all of the proteins and interacting pathways first found using middle T are universally important in controlling normal and cancerous growth. With all the kerfuffle on the Fifth Floor surrounding polyoma, it was inevitable that the SV40 camp started to wonder whether their virus had a middle T antigen too. SV40 large T did some suspiciously oncogenic things, like stimulating cellular DNA synthesis, but perhaps there was more to it than that; perhaps it was just a decoy, or perhaps it was only part of the story. It would be great to find an SV40 middle T, but the problem was that the immunoprecipitation technique, the method of cellular fishing described above, was, to be frank, pretty rubbish. There was certainly a slew of other bands that were pulled down in immunoprecipitates at the same time as SV40 large T, but most of them were probably chopped up bits of large T or background contaminants, there because the anti-tumour antisera could sometimes be alarmingly nonspecific. Yoshi Ito had succeeded in finding polyoma middle T by spending a lot of time tinkering with his immunoprecipitation conditions, and something similar was needed for SV40. Lionel, especially, was aware of this, and started to think very hard about how to proceed, talking at length to the hard-core immunologist Av Mitchison at the ICRF Tumour Immunology Unit just down the road at University College. Av, although sympathetic, was not very helpful. Fortunately, help was at hand in the person of Av’s PhD student, a promising young chap with a knack for immunochemical troubleshooting. To cut to the chase, Lionel and his new recruit would find that there was no SV40 middle T. What there was instead, for all of the marvellous doings of the rest of the Fifth Floor, would in the end eclipse them completely. www.dnalc.org/resources For short, informative, watchable videos on the basics of DNA, cloning, restriction enzymes and molecular biology principles in general, see the Cold Spring Harbor DNA Learning Center website. Angier N. 1988. Natural Obsessions. Houghton Mifflin, New York. 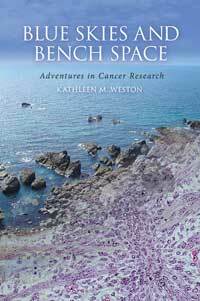 A cracking account of life in Bob Weinberg’s lab at the time of the oncogene cooperation hypothesis. Cheng J, DeCaprio JA, Fluck MM, Schaffhausen BS. 2009. Cellular transformation by Simian Virus 40 and Murine Polyoma Virus T antigens. Semin Cancer Biol. 19: 218–228. Varmus H. 2010. The art and politics of science. WW Norton, New York. Harold Varmus appears only transiently in this chapter, but his autobiography is a fantastic insight into the life of one of molecular biology’s most eminent and interesting personalities. Pawson AJ. 2008. Kyoto Prize Commemorative Lectures: Basic Sciences. “Thinking about how living things work.” http://www.inamori-f.or.jp/laureates/k24_b_tony/img/lct_e.pdf.